The 2000 Coryell Award winner, Bryan Tomlin from Clark Universitywas recognized at the NUCL Business Meeting during the Spring ACS National Meeting. 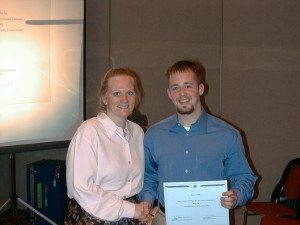 Bryan did his undergraduate research project under the direction of Prof. Daeg Brenner. Bryan Tomlin, from Clark University, receiving the 2000 Coryell Award from Sherry Yennello.